Every year, just in time for harvest, Foxtrot has had a resident Black Bear around the vineyard. Sometimes he has been known to make an appearance at picking time and pickers would comment that it looked like he was dancing when standing up on his hind legs. At the winery we have come to affectionately call him Fred. When it came time to design our label we enlisted Bernie Hadley Beauregard of Brandever Designs to assist us with coming up with a design. We wanted a label that told our story and conveyed a sense of place. 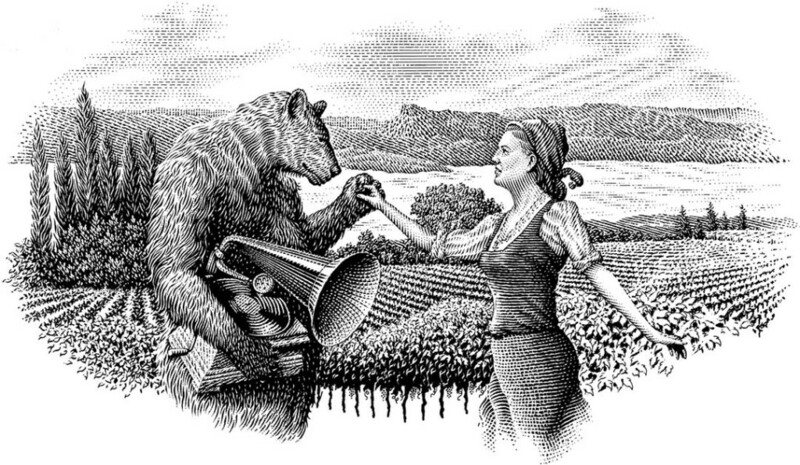 Thus on the front label you will see an image illustrated by Michael Halbert, of our vineyard at harvest time and a bear asking a picking girl to dance the Foxtrot with him, gramophone in hand, harking back to the era the dance was most popular. Many people ask, what does the quote on the back mean? The Foxtrot dance made its debut in 1914 and from the late 20’s through the 1940s was the most popular fast dance in North America. The vast majority of records during this time were Foxtrots. In 1933 MGM studios made a musical movie, starring Joan Crawford, called Dancing Lady. For one of the dancing scenes involving the Foxtrot in the movie they loaned a dancer for a few days from neighbouring studio RKO pictures. Of the screen test the tester wrote, “Can’t act, slightly bald, also dances”. The actor was of course none other than Fred Astaire one of the preeminent and most influential dancers of his time. The picture became a big hit and Fred Astaire went on to have a successful movie career.